As Benicar lawsuits continue to be filed nationwide, one plaintiff has brought a motion to coordinate federal cases involving Benicar side effects into a central court location. This coordination, known as multidistrict litigation or an MDL, would centralize proceedings under a single federal judge for the convenience of the court, parties and witnesses involved in the litigation. The motion was filed with the United States Panel on Multidistrict Litigation by Annette Johnson on December 18, 2014. The federal cases included in the motion all involve plaintiffs that developed severe gastrointestinal injuries after taking the anti-hypertension drug Benicar or other drugs containing the active ingredient olmesartan. Lawsuits have been filed against Daiichi Sankyo and Forest Lab, manufacturers of the drug in question. Currently, at least 15 federal cases have been filed against these defendants in district courts across the country. Johnson is requesting that these cases and future lawsuits be centralized in U.S. District Court for the Northern District of Ohio, where they would be overseen by Judge Dan Aaron Polster. Johnson chose the Northern District of Ohio because nine of the 15 cases currently pending have been filed in that court. Judge Polster was selected due to his experience handling the massive Gadolinium litigation involving more than 700 plaintiffs. Johnson asserts that the Gadolinium MDL may be comparable in “duration, complexity and scale of discovery” to what is expected in Benicar litigation as more cases are expected to be filed. 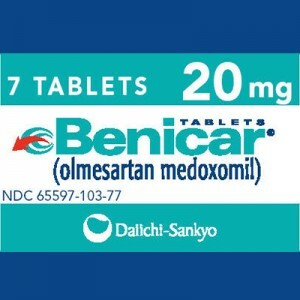 Benicar is part of a family of drugs used to lower blood pressure. The active ingredient olmesartan is also found in Benicar HCT, Tribenzor and Azor. Although the drugs have been on the market for a number of years, concerns over serious gastrointestinal side effects linked to the drugs have recently come to light. Some patients taking the drugs have developed a condition known as sprue-like enteropathy, which includes symptoms like chronic diarrhea, weight loss and abdominal discomfort. Individuals that developed these symptoms are often misdiagnosed with Celiac disease or other GI disorders. Those individuals often continue taking Benicar, risking permanent damage to the intestines. Some patients have also been hospitalized because of their symptoms, when simply stopping the medication might have been sufficient in reversing the condition. In July 2013, the FDA issued an updated safety communication, linking use of drugs containing olmesartan with a higher risk of intestinal disorders like sprue-like enteropathy. The agency warned that symptoms of the disorder could develop months or even years after the drug is first taken. Once the drug is stopped, all patients observed saw a clinical improvement in GI symptoms. The FDA warning has brought to light the risks associated with Benicar and other drugs containing olmesartan. Some individuals have now filed Benicar lawsuits, alleging they were not properly warned by drug manufacturers about the potential dangers of the medication. In addition to the 15 cases filed in federal court, over 30 complaints are now pending in New Jersey state court. Johnson asserts in her motion that coordination of federal cases would prevent conflicting rulings and duplication in discovery, while saving time and money for all parties involved in the litigation. Have You Been Injured by Benicar?